Discussion in 'Server Announcements' started by Tatorminator88, Feb 8, 2019. Another week has come and gone! To help you to enjoy this upcoming weekend, our team has been hard at work with this weeks treasures! The end of the world is upon us, and how else do you expect to live without your Survival Kit! 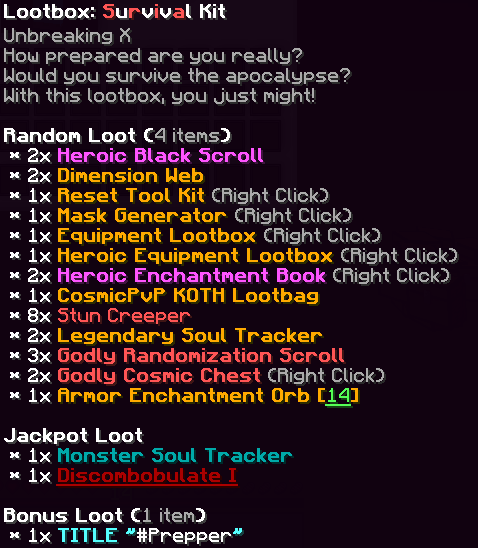 Keep in mind that some of the items can only ever be obtained in that weeks Lootbox! Once the weekend is over, the Lootbox, and its treasures, are gone FOREVER! This weeks Lootbox will give you 4 "Random Loot" items, which could include any of the "Jackpot Loot" items, and the 1 guaranteed "Bonus Loot"! Making grinding mobs fun again! Get your favorite Netflix series ready and grind for hours as we introduce a new way to get those dreaded souls! If you like to Raid or you like to Troll, this is the enchant that you will want to get your pixel-ed hands on! Hope you base factions are ready to keep an eye on those buffers! Many of you have already noticed some of the new streamlining and optimizations that have been put in place. Two things to highlight are TPS as well as being able to allow more players on each planet which will help during peak times! Huge shout out to @Vaquxine. This feature has been brought back to help aid you and your factions when trying to search for a specific tier of enchants. No longer will you have to have /pvs full of ceggs or dubs of them at your base. You will now be able to stack Creeper eggs again to make it easier for you to transport them around while raiding or pvping. This applies to new Creeper Eggs only. To help keep you and your factions alive this weekend, there will be a 35% Off Sale on all packages at the Server Store! No longer will you have to have /pvs full of ceggs or dubs of them at your base. You will now be able to stack Creeper eggs again to make it easier for you to transport them around while raiding or pvping. doesn't work on existing ones my dude. what is the point of discom if its the same as ghostly ghost? also when will stacking of randomization scrolls / transmogs be fixed?